Hertz Furniture, leading online furniture supplier, has announced a new sale. 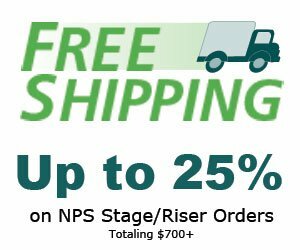 From today through the end of November 2012, customers who spend more than $700 on National Public Seating (NPS) stages or risers will enjoy free shipping within continental USA, as well as Quick Ship (five-day delivery) service. The offer, which is available by phone order, applies to standard tailgate delivery only. NPS is a leading supplier of industrial furniture which specializes in top-grade stages and risers used by performers such as choirs, choruses, and bands. Their extensive collection of stages and risers are portable, easy to fold and unfold, and come in a range of heights, depths, and styles. Hertz Furniture backs up NPS products with its Extended 25-year Warranty. For example, the Trans-Port Tapered Riser is a three-level carpeted choral riser which supports up to 266 lbs. per square foot and flips open in five easy steps, saving users the time and energy of having to set up a multi-level riser on their own. Understanding that schools and institutions operate on a limited budget, NPS products are durable yet affordable. "Hertz Furniture remains committed to quality customer service and providing products tailored to meet each user's needs," says Hertz Furniture President Saul Wagner. "We are proud to announce our latest promotion, free shipping for NPS stage/riser orders totaling $700+, allowing us to partner with schools and institutions to help their visions come to life and their performance dreams become a reality."